I ordered the Snake Plissken jacket in pre-distressed goatskin with functional zipper, and I'm extremely happy with it. Indy Magnoli was very communicative during its construction, promptly answering e-mails and sending progress pics, and this was greatly appreciated. Furthermore, the measurements I provided were followed exactly, and I was pleasantly surprised by how well it fit when I first tried it on. 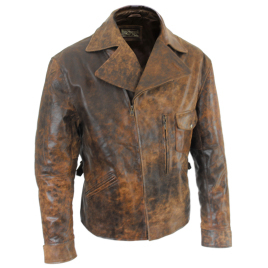 Indy Magnoli and his tailors have produced a great replica of another iconic movie jacket, and I'm proud to be the owner of the first one he made in goatskin. And did I mention his great customer service and communication? :) The jacket was also produced very quickly, so, again, I was pleasantly surprised by how fast I received it. Will I buy from Magnoli Clothiers again? Definitely!